Melania? Is that you? Blink twice if you’re the real Melania, please. Earlier on Wednesday, a clip of Donald Trump speaking to the press, alongside his wife, Melania, began circulating on Twitter. The clip might have gone by without much scrutiny or attention if it had not been for one small detail: Melania Trump appears to be, well, maybe not Melania Trump. 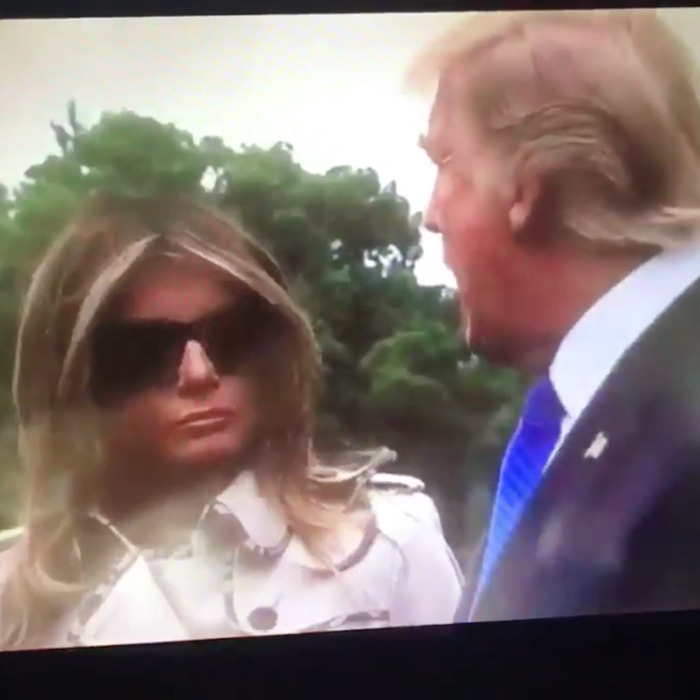 Internet conspiracy theorists were quick to call out the clip and claim that the woman standing beside Trump — she’s dressed in a trench coat and dark sunglasses, which cover much of her face — isn’t the real Melania. “My wife, Melania, who happens to be right here,” Trump says in the clip, which, honestly, doesn’t help his case. So is this the real Melania? Probably. Maybe. Who can say? The only thing we can say with 100 percent certainty is that the fake-Melania memes have arrived. And they’re pretty decent. Me: Time to take a break from Twitter. Twitter: Did you hear about fake Melania? Me: "I really don't have time for BS right n-"
Internet: "Trump's speaking to the press with a fake Melania." Melania, blink twice if you’re in there.